The bazaar offers the chance to purchase specific cards directly. To search for a card use the search function on the left side. You can use the filters to narrow down your search or select a specific card. You can purchase almost all cards instantly or in an auction at a good price. The bank offers a set number of cards of each type on the bazaar. When a manager purchases a card from the bank, the bank will buy a card from the same type from a manager. The bank will always accept the lowest offer. The bank then adds the card back to the bazaar and offers it again to all managers. 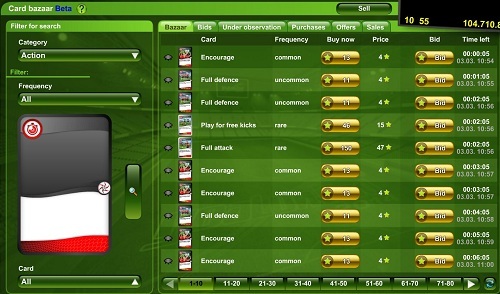 The sales offer of a manager run for a total of 72 hours, unless the card is purchased by the bank. A 2% posting fee is charged for creating a sales offer, with a minimum of 2 STARS. The STARS are deducted from the STAR balance when the offer is added. You can also offer cards in packages. It is possible to offer up to 25 cards at once. If a manager wants to sell more cards, he has to create multiple auctions. The bazaar agent will also buy individual cards out of stacks if he does not need the full amount. To sell a card you have to click on “sell” on the top bar at the bazaar. Then you just have to select the desired card from the card deck, drag it into the card slot and set the sales price. Depending on supply and demand the bank adjusts the number of cards it offers. If many cards of a type are sold and bought, the bank increases the volume, and vice versa.